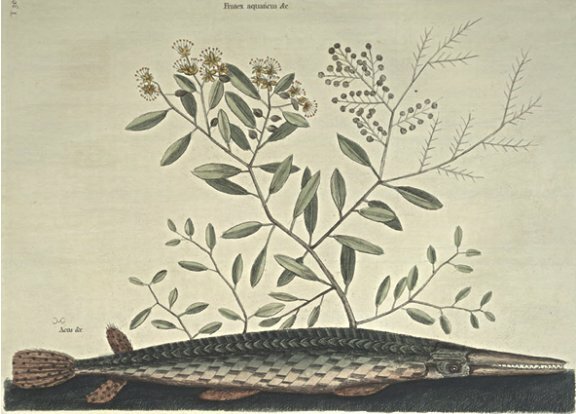 These Fish arrives to three Feet in Length, have a very long Mouth or rather Bill, armed with many small Teeth, the Eyes were placed very low; the upper part of the Body green, the Belly pale red: it had six Fins, two under the Fore-part of the Belly, two under the Hind-part of the Belly, and one near the Tail; opposite to which on the Back was another smaller one; the Tail of an oval Form, of a Brick red Colour, sprinkled with round black Spots, as were the two Fins next the Tail, and of the same Colour, the other Fins were of a fainter red. The whole Body was covered with an entire hard bony Coat, divided into large Scales, which on the Belly were of an oblong square Form, and placed obliquely. These Fish are found in Ponds and froth water Rivers in Virginia. These Plants grow usually about twelve Feet high, arising with innumerable small Stems, alternately bent, from which shoots forth smaller Twigs, set with small pointed smooth Leaves; the Flowers grow on the Tops of the Branches before they open, being inclosed in small brown pointed Periantheums, set on short Foot-stalks; are hexapetalous, of a deep yellow Colour, with long Apices of the same Colour: They grow in shallow fresh Water Ponds, in the Woods of Virginia and Carolina, and in the beginning of February adorn the Woods, when few other Plants appear in Blossom: The Flowers are succeeded by small round Capsula's, which in March and April divide into four Parts and disclose their Seeds, which are very small, and being dispersed by the Wind into watery Places, spring up very thick and blossom in a short Time.